Instant Decision Module permits accurate lending decisions in an instant. It is a SAAS solution dedicated to lenders, including digital and mobile lenders from the financial and non-financial sectors, to enable automated accurate credit decisioning. The Instant Decision Module opens more room for more opportunities for established lenders, as it provides automated decision-making in existing institutions and products with really simple integration and minimum IT effort. One of the key features making the Instant Decision Module unique is Creditinfo’s ability to combine credit bureau data with customer and alternative data, such as mobile wallet activity and customer history. All without complex integration and available online, practically on the spot. In addition to that, Creditinfo has the reputation and brings the benefit of integrating specific know-how in credit risk management and in-depth expertise in decision technology – a synergy that Instant Decision Module is resulting from. Instant Decision Module ensures automated usage of Creditinfo’s international experience and best practices in credit risk management. This solution also significantly reduces or eliminates effort needed to assess customer based on credit data. Amongst other benefits, there are unification and centralization of your evaluation process. 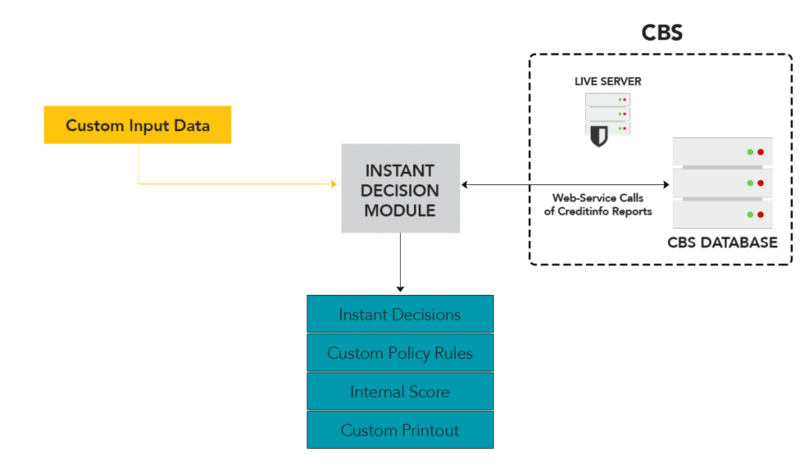 Instant Decsion Module eliminates human errors and manipulations, stores data for decision-making policies enhancements and enables custom printouts to ensure documentation processing efficiency.